It's your chance to join the Move! : A Marketing and Financial Education Seminar for Artists and Musicians at the Outpost Restobar on June 26, 2010 by 1:00 to 6:00 pm. Have an opportunity to Move! learn and interact from Marketing and Financial Experts Alex Uypuanco, Roy Sencio and Jon Siu. Seminar fees inclusive of activity kits and snacks range from Php 500.00 (non-Artist Ko member) to Php 400.00 (Artist Ko member). US- Based Online Marketing Consultant specializing in the Search Engine Optimization, Social Media and Online Branding. His talk, via video, will be on how to strengthen online presence and gain tangible results in selling products online. A Financial Educator with exemplary knowledge on savings and investment. He'll talk about the proper options for the artist on how to save, invest and make money and ultimately avoid poverty. Be there and take advantage of this unique opportunity by joining Move! 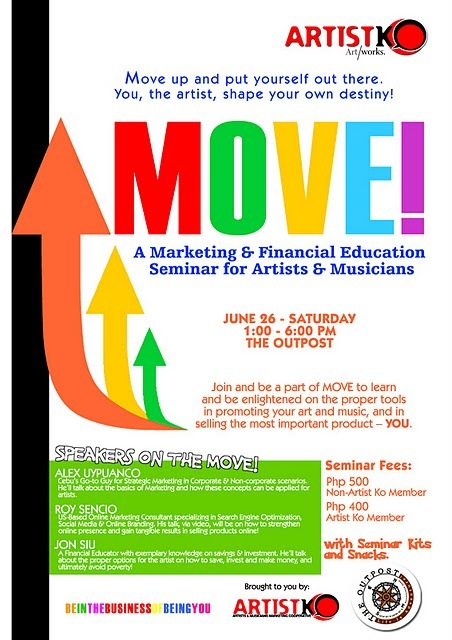 : A Marketing and Financial Education Seminar for Artists and Musicians! The event is brought to you by Be In The Business Of Being You, Artist Ko and The Outpost. You can get a slot reserved by emailing artistkocebu@gmail.com.